Drivers are seeing and reporting more potholes in Kansas City, Missouri, this year compared to last year. The city's communications director said from Jan. 1 to Feb. 12, the city's 311 call center received 1,407 reports of potholes in the city. During the same six-week period in 2018, the city received 256 reports. To keep up with the number of potholes, the city is testing how well a temporary fix called a "Thump Pad" works. The pads look similar to sandbags, but are filled with a special gel. KANSAS CITY, Mo. 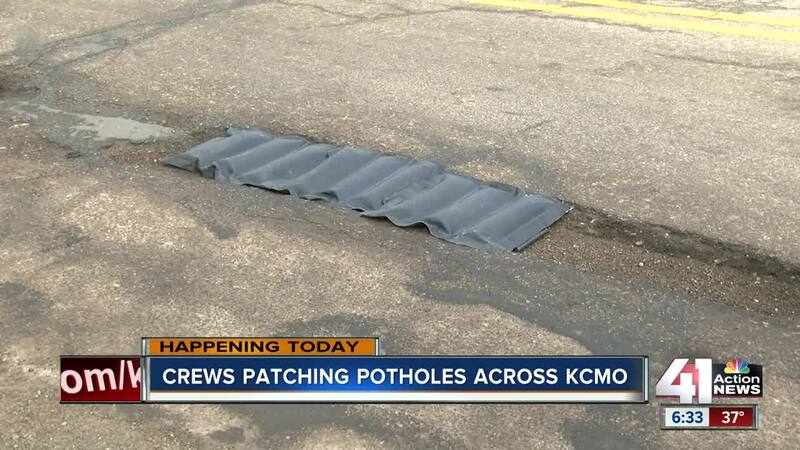 — Drivers are seeing and reporting more potholes in Kansas City, Missouri, this year compared to last year. The city's communications director said from Jan. 1 to Feb. 12, the city's 311 call center received 1,407 reports of potholes in the city. During the same six-week period in 2018, the city received 256 reports. To keep up with the number of potholes, the city is testing how well a temporary fix called a "Thump Pad" works. The pads look similar to sandbags, but are filled with a special gel. Supervisors and inspectors who are on the road all day for their job duties carry a few pads. When they stumble upon a large pothole, they throw the bag in the hole. "It creates a much better ride for you as a driver. And then they can call in a repair and get a crew over there more quickly," explained Chris Hernandez, communications director. Wednesday and Thursday city crews planned to repair as many potholes as possible. By Wednesday morning, crews had repaired 802 of the 1,407 reported potholes. But Hernandez said there are more potholes than people report. "The issue right now is we've had a very cold, wet winter. A lot of freeze, thaw cycles. That means that wet, rainy mix that comes down and then freezes, it gets down there and pops out the chunks [of pavement]. It also pops out the cold mix [patches]," explained Hernandez. The city said it has 30 job openings within the public works department right now. That's 30 extra people who could be on a crew fixing potholes. To apply for job as an equipment operator or in street maintenance, click here. Cleophus Hawkins works for the city. Wednesday he was part of about a dozen teams spread out across the city pouring asphalt in potholes. "I drive these streets and I don't want my tires busted. So I make sure they are right," he said with a laugh. The city uses two different types of asphalt: a hot mix and cold mix. Hernandez said the hot mix offers a more permanent fix, but crews can only use it when the outside temperature is 40 degrees or warmer. So most of the winter, crews have used the cold mix, which is a temporary repair. Thursday, the city council will review a budget proposal for next fiscal year which suggests increasing the amount of money dedicated to road repairs to $16 million from $10 million. If approved, the funding increase would pay for more paving and maintenance projects and could reduce the number of potholes drivers see next winter. Hernandez said the city's office of innovation experimented with different programs to predict and prevent potholes. It tested the system on 10 roads around Kansas City. The city learned the system was not easy to deploy in the field and did not provide the results it wanted, but Hernandez highlighted how the city learned from the pilot program. "It was a great collaboration, it taught us to dream big, see if it would work. What it did is it gave us better information about data analysis and how to use that to handle our infrastructure needs," he explained. If you see a pothole in the city limits of Kansas City, Missouri call 311, or report it online by clicking here.